← Have a quick question? Text a Librarian! People who buy e-readers tend to spend more time than ever with their nose in a book, preliminary research shows. A study of 1,200 e-reader owners by Marketing and Research Resources Inc. found that 40% said they now read more than they did with print books. Of those surveyed, 58% said they read about the same as before while 2% said they read less than before. And 55% of the respondents in the May study, paid for by e-reader maker Sony Corp., thought they’d use the device to read even more books in the future. 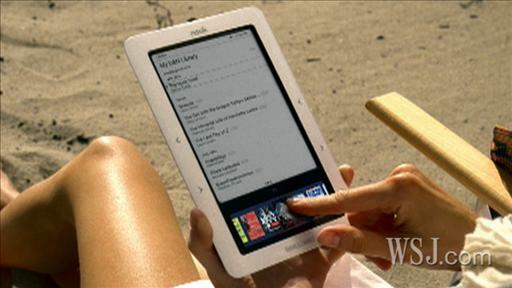 The study looked at owners of three devices: Amazon.com Inc.’s Kindle, Apple Inc.’s iPad and the Sony Reader. While e-readers are still a niche product just beginning to spread beyond early adopters, these new reading experiences are a big departure from the direction U.S. reading habits have been heading. A 2007 study by the National Endowment for the Arts caused a furor when it reported Americans are spending less time reading books. About half of all Americans ages 18 to 24 read no books. Some 11 million Americans are expected to own at least one digital reading gadget by the end of September, estimates Forrester Research. U.S. e-book sales grew 183% in the first half of this year compared with the year-earlier period, according to the Association of American Publishers. Among early adopters, e-books aren’t replacing their old book habits, but adding to them. Amazon, the biggest seller of e-books, says its customers buy 3.3 times as many books after buying a Kindle, a figure that has accelerated in the past year as prices for the device fell. It’s too early to tell the reading lift will sustain after the novelty of the gadgets wears off, and the devices go mass market. But because e-book gadgets are portable, people report they’re reading more and at times when a book isn’t normally an option: on a smartphone in the doctor’s waiting room; through a Ziploc-bag-clad Kindle in a hot tub, or on a treadmill with a Sony Reader’s fonts set to jumbo. Among commuters, e-readers are starting to catch up with BlackBerrys as the preferred companions on trains and buses. Since getting her Kindle last year, Leslie Johnson has been reading more often and in more places—like on a kayak. On a recent trip, the 34-year-old engineer from Albany, N.Y., settled into a science-fiction novel while her husband fished. “I put it in a waterproof cover,” she says. Mystery and thriller author Michael Connelly says he has about 30 e-books on his Kindle, Sony Reader and iPad, though he also still reads print books because he gets so many samples from his publisher. The first consumer e-books, which were released in the 1990s, failed to catch on among consumers who were stuck reading them on computers or tiny cellphone screens. Earlier this summer, Jakob Nielsen, a Silicon Valley researcher who has studied how people interact with technology for more than two decades, recruited 32 volunteers and asked them to read short stories by Ernest Hemingway in print, on an iPad and the Kindle. Mr. Nielsen timed how long it took them to read a story on each device. Compared with print, iPad readers were 6.2% slower and Kindle readers were 10.7% slower, though the difference between the iPad and Kindle results wasn’t statistically significant. Mr. Nielsen suspects the slowdown is caused by the screen technology in the devices, which is still less sharp than print. “Both devices give you a more relaxed feeling as opposed to a computer,” said Mr. Nielsen, who runs research firm Nielsen Norman Group along with former Apple researcher Donald Norman. 9% of consumers increased their purchases of hardcover books in the past year. Source: Book Industry Study Group survey. In creating the Kindle, Jeff Bezos, Amazon’s chief executive, says he set out to develop technology that could encourage long-form reading, instead of just snippets. E-readers also appear to be narrowing the gap in how men and women read. A study, released this month by the Book Industry Study Group Inc. found that men are bigger consumers of e-books than women by a narrow margin. Among e-book buyers, 52% were men compared with 48% for women—a reversal of print books, where women buy more. E-reader users also say that 52% of their e-books were ones they purchased, while 48% of their e-books were free because they were sample giveaways or out-of-copyright. Libraries are expanding services that let patrons virtually “check out” an e-book through the Internet, with e-book files that automatically lock down after the end of the loan period. According to the American Library Association, 66% of libraries offered e-book loans, up from just 38% in 2005. The most checked-out adult fiction e-book at libraries is Stieg Larsson’s bestseller, “The Girl with the Dragon Tattoo,” according to Overdrive, a company that provides e-book loans for more than 11,000 libraries. The same is true at Amazon, the largest e-bookstore online, where Mr. Larsson also tops e-book bestseller lists. There are some aspects of reading a print book that e-readers still haven’t been able to re-create. Digital locks on e-books make it harder to lend a book to a friend, though free works are being shared much more rapidly online than ever before. Scribd.com, a social publishing and reading website, is used to share books and documents about 10 million times each month, the company says. Are E-Books Worth the Money? Page numbers are a problem for e-books, since the number of words on a virtual page depends on the size of the screen and type. Pages may be antiquated, but they’re very helpful for making sure reading-club participants or students in a classroom are all on the same page. No page numbers also means there’s no skipping ahead to sneak a peek at a page near the end of a book. Most e-readers have tried to replace page numbers by showing the percentage of the book read. Technology has brought a range of features to books that wouldn’t be possible in print. Children’s author Lynley Dodd sells a title from her “Hairy Maclary” series as an app for the iPad. It lets parents or kids record themselves reading the book aloud, and a paint function lets kids color the original drawings themselves. With an e-reader, readers can hold and turn pages with just one hand. Some readers hail how the devices can become large-type books with the click of a few buttons—and back-lit devices like the iPad work in bed even when the lights are off. Free sample chapters, common on most online stores, make it easier to try out—and potentially give up on—books before committing to a 400-page tome. But paper pages do have one benefit that electronic devices don’t have: They don’t need to be put away during takeoff and landing on airplanes. On a recent trip to Seattle, 64-year-old Jamie McKenzie, a Bellingham, Wash.-based writer, said he felt a sense of superiority when his seatmate was asked to turn off his Kindle to prepare for takeoff. “That guy may have had access to 10,000 books, but I was the one who was able to keep reading,” he says.